This entry was posted in Hand, TIPs, Tutorial/How To, Wool. Bookmark the permalink. Patty, I loved watching you make these special soaps, almost too special to use. Pretty as a picture all on their own. So great of you to give us the steps to this process in both words and pics. i love it! i know i say this about so many things out there, but i actually mean it: i WILL make this! thanks so much for sharing. i think it’s perfect for little hands who have trouble holding onto soap in the tub. ooh Patty your pictures and soaps are just beautiful, fun isnt it?? Patty… you have the same enamel bowl as I do! Ha, two minds – remember?! I LOVE your felting… I might try that too someday sitting in my little backyard. It looks so tempting! Those soaps so so cute!!!! small wash board. Thanks for your gift. I have NEVER EVER seen this before Patty! You can use it as normal soap ? I DO have an old washboard !!! ….I feel homemde Christmas presents being started ! Girl, you wear me out. When I think of something to get you…. I need to mail it immediately. I have felted soap here to send you that I BOUGHT. Then the other day you told me you felted some…I just kept my mouth shut. I cannot keep up with you. You know I’m tired, don’t you? Lovely idea and gorgeous work. I’ve wanted to make these for a long while — I received one for Christmas and thought it was the best! Thanks for the instructions — I really didn’t know quite where to begin. One question — with wee travel soaps, they don’t melt too much with the felting, do they? 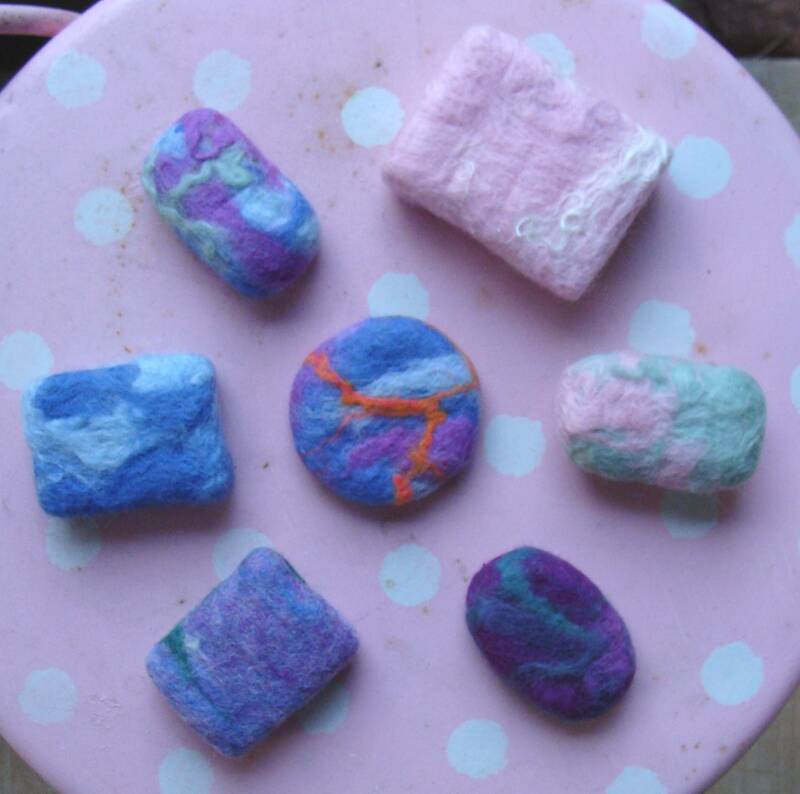 these felted soaps are so lovely. I’ve only recently learned how to wet felt and this is such a cute little project. Thanks for sharing. I never thought about using travel sized soaps. I have many of those and many are large bars. I didn’t use a washboard, but just scrubbed against the side of the sink. Good to know I could have found an easier way to felt them. Love the designs, too. I’ve done my share of felting an soap always plays a part, but I ‘ve never felted onto the bar of soap itself, seems like a good idea really!